Are Your Bowel Movements Healthy? Did you just cringe a bit? Let’s face it, poop isn’t anybody’s favourite topic. Nonetheless, our bowel movements hold valuable clues to our overall health. But these signs are often ignored because most of us are a bit uncomfortable talking about them, even to our healthcare providers. The appearance and smell of your poop is a direct reflection of your overall health as well as any inflammation your gut is experiencing, as your digestive system connects intricately with your nervous system and detox pathways. Changes in your bowel habits can indicate changes in other parts of your body, from excess stress, to liver problems, to cancers. The good news is that we don’t have to go into great detail describing the various types of bowel movements and what they signify. 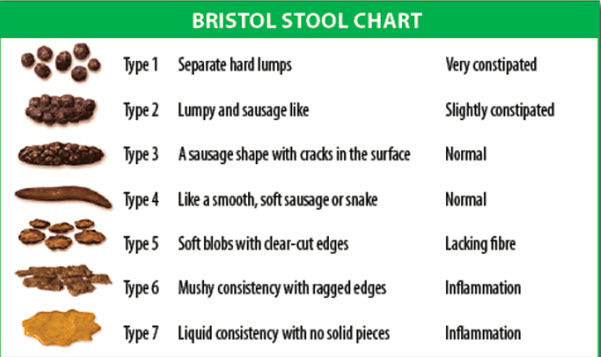 There’s already a chart that shows various problems and what to look for called the Bristol Stool Chart (http://cdn.intechopen.com/pdfs-wm/46082.pdf) after the hospital that developed it in 1997. Pay attention to your stool. Do you see undigested food in your stool? Are you wiping a lot after a bowel movement (ie sticky stools)? Does your stool keep its shape? All of these things give us clues to your health. 1. Pay attention to your diet. Fiber helps keeps things moving by adding some bulk to your stool - think seeds, whole grains, beans, fresh fruits and vegetables. If you’re not used to a high-fiber diet, increase your fiber intake slowly to avoid upsetting your stomach, and always make sure to up your water intake alongside extra fiber. In addition, make sure you’re eating enough healthy fats from sources such as avocados, nuts, and olive oil. 8. See a pelvic floor specialist physiotherapist. A physiotherapist that is specialized in the pelvic floor can assess the muscles of your pelvic floor. Bowel movements affect the pelvic floor muscles that can lead to incontinence. Candida: Are You Experiencing Yeast Overgrowth?